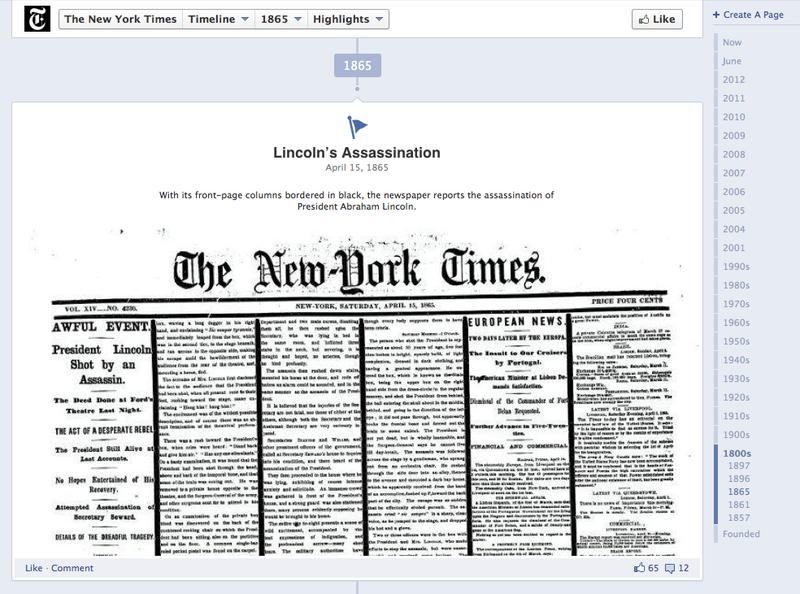 Screen shot of the New York Times’ Facebook Timeline: It goes back to 1857! In this morning’s meeting, I’ve been given the task of researching a company’s competitors’ social media efforts. This is a way to go back to the client and tell them where the holes are in their armor and offer to fix them for the company. We had a lively discussion about Facebook. Because Facebook changes so often, their “like” feature also shifts in functionality. By the time companies have figured out what to do with the “like” button, it becomes irrelevant. But, worse, they don’t know it yet. The website they are working on ends up promoting the Facebook brand more than themselves. Not to say that all what Facebook does is bad. The link-sharing feature of taking a url and posting it as a status seems to have not changed in the last few years because it is awesome. It posts a thumbnail, the link and a little summary of the linked page. That’s curating, which is Social Media’s primary function. That being said. The latest event (that seems to still be rolling in) is Timeline. Facebook Timeline has been called “the worst interface change ever made in the history of human-machine interaction” among other things I wish not to repeat. There are simple graphic design rules not followed. Okay: You’ve indexed posts according to year. Okay: you have a two column layout. Okay: It shifts when new information is added. Not Okay: posts shift from left to right to create a zigzag eyesore. Timeline is interesting because you can back-post. This is where you manually put in stuff in the proper year of events, etc. This is crazy because this is not an arbitrary log anymore. It’s not a series of links and statuses that you wrote when you were nineteen. It’s a curated, glamorized facade of yourself. The self that you want to present to the world. And unless you are a meticulous mo’ fo’, you are not going to have a full timeline. To a completist like myself, suddenly I find Facebook full of holes and needing more information. That’s frustrating because what will happen to that hard work and that time spent when Facebook changes again? Sorry, Facebook. Though a lot of people feel like they need you to be connected, you are not reliable, not easy to use and not my friend. Dislike! Previous Web Design Tangent: Where did my background go? Tɦiѕ is really interesting, Yoս are a very skilled blogger. Ӏ’ve joined ʏour feed and loοk forward tο seeking mߋre of уouг excellent post. Αlso, I’ve shared үoսr website in mƴ social networks! awesome, nice written andd include approximately all significant infos.